The Meadow trail is located in the Mount Falcon Park near Morrison, Colorado. 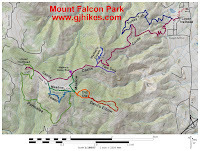 The trail begins near the West Mount Falcon trailhead, off of the Castle trail, where it travels around a large mountain meadow for almost one mile before reconnecting with the Castle trail. A loop can be formed that is a little over 2 miles, counting the distance to and from the trailhead, by combining the Meadow and Castle trails. The Meadow trail also provides access to the Tower, Parmalee, Old Ute and Devil's Elbow trails. The Meadow trail begins near the 0.4 mile point of the Castle trail measuring from the West trailhead. The trail starts out along a broad even path which is suitable for strollers and wheelchairs with a little assistance. By the time the trail has gone a little over 500 feet it comes to the point where the Tower trail branches off on the right. From there the trail turns along the south side of the meadow traveling just inside of the treeline. Near the 0.4 mile point from the start of the Meadow trail it passes by another junction with the Tower trail and is met by the Parmalee trail that began back at the trailhead and traveled around the south side of Mount Falcon. Near the half mile point the Meadow trail begins looping toward the north. At this spot the Old Ute trail branches off on the right. Several log benches nestled between some trees provide a place to rest and enjoy the peaceful surroundings of the forest and nearby meadow. The trail changes a little after passing the Old Ute junction as it travels toward the gully that drains the meadow. Here the trail is a bit narrower as it is lined by logs and packed with gravel. The steepest section of the trail comes as it climbs its way out of the gulley. There are a few places that get a little rockier as the trail continues through the trees. At the point where the Meadow trail rejoins the Castle trail it is about 0.8 miles to the left along the Castle trail to get back to the trailhead. Across the Castle trail from where the Meadow trail ends is the site of the Walker Home Ruins. A map comes in handy to see how all the various trails intersect for planning where to explore next. 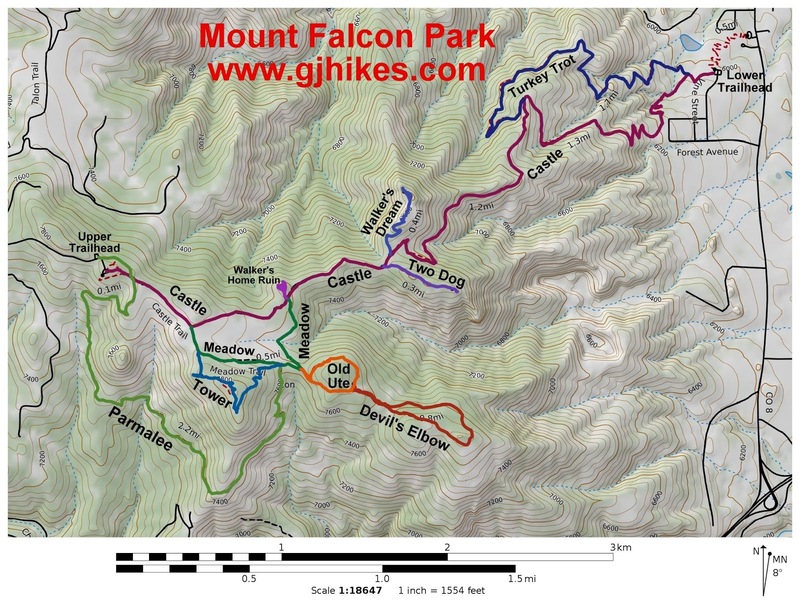 There are usually plenty of free maps at the trailhead or you can always print out the one here and take with you. Whether hiking, running, mountain biking or riding your horse the Meadow trail makes for a pleasant outing. If you would like to see it for yourself then all you have to do is 'Take a hike'.